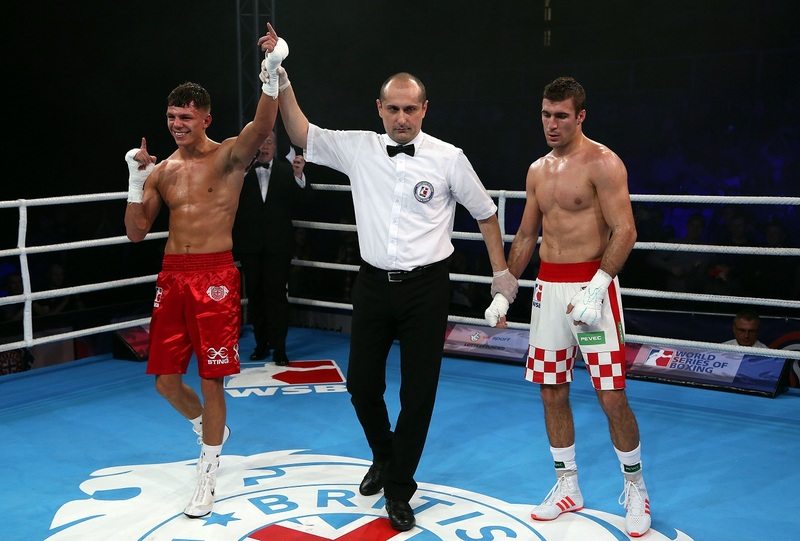 The British Lionhearts made a triumphant first appearance in the North East with a thumping 5-0 victory over the Croatian Knights in the World Series of Boxing (WSB) on Friday night (16 February 2018). Three boxers from the region, Kiaran MacDonald, Calum French and Pat MCormack delivered unanimous victories to delight the noisy, sell-out crowd at Gateshead Leisure Centre in a tremendous night of boxing for the North East. A unanimous win for Ireland’s Joe Ward and a victory for Kiwi, Patrick Mailata, whose opponent was pulled-out after three rounds of the super-heavyweight contest, completed the rout as the Lionhearts overpowered the team from Croatia. Calum French said: “I knew I had a few people coming but I couldn’t have imagined how loud it was in there tonight. It really spurred us on. “That was the biggest crowd I have boxed in front of and probably the most amazing experience I have had in the ring. I have boxed in ABA finals and at majors all over the world, but to come out in front of my home crowd and see everyone bouncing was really good and makes the hairs stand-up on the back of your neck. Pat McCormack added: “In the dressing room on the pads beforehand I was very relaxed and not nervous at all. After the first round I knew I was going to win so I wanted to put on a show for my home fans. In the Lionhearts’ first home match of the new season, Sunderland ABC’s, Kiaran MacDonald began proceedings in a flyweight battle against Croatia’s overseas selection, David Alaverdian from Israel. In his first bout at flyweight (after recently moving up from light-flyweight) MacDonald boxed at range to consistently pick-off Alaverdian in the first three rounds. And despite tiring in the fourth round, the Sunderland man had enough in the tank to come back strongly in the fifth and secure a unanimous win on all the judges’ scorecards to the delight of the home support. MacDonald said: “That was my first fight at flyweight and I think I made a big statement there. I have been doing a lot of work with the strength and conditioning coach and the nutritionist (at GB Boxing) to bulk me up and grow into the weight. Convincing wins for light-heavyweight, Ward, and super-heavyweight, Mailatta, in the next two bouts gave the Lionhearts an unassailable 3-0 and ensured the British team would go home with all the points from the fixture. It relieved any pressure that might have been on the home favourites, French and McCormack, and the duo from Birtley ABC more than lived-up to expectations with convincing victories to delight the partisan crowd. French gave a totally dominant performance against Matteo Komadina in the lightweight contest, tracking his opponent around the ring for five rounds, consistently landing his southpaw jab on an opponent who struggled to cope with the Gateshead’s man’s relentless pace and accuracy. His unanimous victory, which included scores of 50-39 and 50-42 on two judges’ scorecards, made it 4-0 and maintained French’s unbeaten record in WSB. It was left to welterweight, McCormack, to complete the whitewash and the Birtley ABC man did not disappoint as he showed-off his full range of skills to outclass Mate Rudan in the final bout of the night. Clearly enjoying himself and keen to deliver a strong performance on his first contest in the region for over six years, McCormack had too much class for his opponent. And despite getting drawn into a couple of scrappy clinches, the Washington man was always in control as he eased to a unanimous points win to cap a stunning homecoming for the British Lionhearts. Rob McCracken, Head Coach of the British Lionhearts added: “It was an excellent team performance tonight and all five of the boxers did very well. “It was great for the North East lads to be able to box at home and the crowd was fantastic tonight. There has been quite a lot of build-up to this and that does create a bit of extra pressure but all of the boxers’ handled it well and can be proud of the way they performed. The British Lionhearts next fixture is a home match against Italia Thunder at The Auditorium, Echo Arena Liverpool on Friday 2 March 2018, when European Champion Peter McGrail will box in front of his home crowd. Tickets are on sale now at www.gbboxing.org.uk/tickets and http://www.echoarena.com/whats-on/world-series-of-boxing/.